It was a cold night in Hungary.. The Magyar hordes were getting restless under a sky the colour of saddle-worn leg armour. "There's something afoot young Puskas" muttered the gnarled old horseman as he saddled up his fleet-footed mount. "I can feel it in my bowstrings". "In your bowstrings ?" replied his young companion. "That's the problem with all you old Minifigs castings - too many cheesy historical novels make you feel obliged to spout crap. Us newer Essex figures are far more pragmatic, never mind more correctly anatomically proportioned... well, that's what your wife said to me last...erm, sorry, forget I said that"
Stanislavsky, veteran of a full two dozen competitions, furrowed his brow. "What do you mean?" he muttered in a Hungarian accent so thick you could sprinkle paprika on it and call it a goulash. "Well" replied his slightly smaller but more textured on the surface compadre in arms said, swiftly changing the subject back to the upcoming battle "whilst you are worrying about the tautness of your bowstrings I'm a lot more concerned about that screaming mob of Lithuanians coming over the horizon at us like a 4 tonne dice rolling down a very steep hill". So began game 1 of the upgraded Lithuanian odyssey in Switzerland. The train times had been impeccable (we had arrived at the airport just in time to miss one, forcing us to stop and have a beer), the food in the Cafe du Commerce had been, erm, well lets just settle for "partly identifiable". The night-club had been refurbished (now "Discotheque Spook..") and still served RVRB, and Dave Madigan and his Hungarian army faced me after 3 hours of sleep. Gripped by madness I elected to attack in Winter. 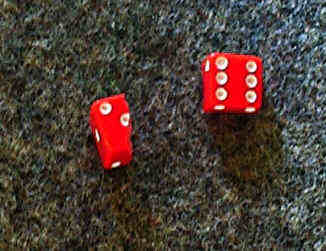 The gods of Comedy responded in style, granting me first a split die on my very first roll (how inauspicious was that!!!) and then, to follow it up, 6-1 dice roll, and Lo and Behold, the skies above the Hungarian army grew dark. A chill wind stirred their many banners into listless life, as if they were a ward-full of low tog hospital duvets in an extreme flatulence treatment institution. Yes, Dave was feverishly flicking through his rules to find the "Snow" page! The Hungarian army deployed conventionally, with foot protected by wagons in the center, and Lh on the flanks. In response I had both large commands on the flanks with the Teutons in the middle. The decisive moments all took place on my left where my cavalry command was looking to get to grips with Dave's Lh at their earliest convenience. Oddly this sentiment was shared by the Magyars and they crashed into contact with my line, scoring a few early goals. But then, just as life started to get interesting it suddenly got even more so, as snow started to fall as thick and fast as Swiss banknotes fall on a bar to buy rounds of RVRB in a crap night-club. 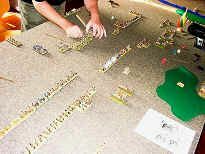 Dave's army were paralyzed - unable to exploit their fleeting advantage, unable to use their greater C3, they floundered whilst the superior Lithuanian firepower (OK, 4 CvO if you want to be pedantic) was slowly applied to the fragile Lh line. They were going down - and they knew it. The messenger was dispatched through the blizzard "Get the Germans!". But the wily Grand Master of the Order was having none of it. Advancing bravely backwards the 3 Brothers cleverly (ahem) drew in the line of spear and waited for their moment to excel. Freed of the need to pursue the by now broken Hungarian right 2 bowman and wagon turned their attention to the spear block. The Hungarian-built wagon defending their flank as a result then suffered a catastrophic mechanical failure, and on checking his warranty the driver discovered his roadside assistance cover unfortunately did not cover him for 3-1 base factor shooting combats and was promptly towed away. The Teutons swung round onto the flank of the unprotected spearmen - now even bereft of their supporting Psiloi after more wagon-based intervention. General, 2 overlaps, 2 ranks of spear - as the old Master himself said afterwards "Vorsprung durch better dice dear boy, Vorsprung durch better dice!"